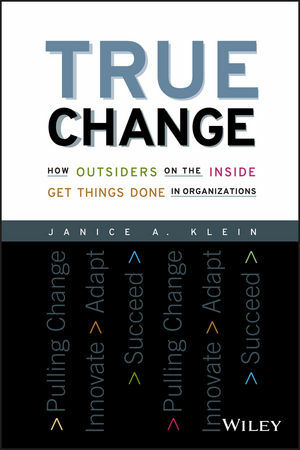 Drawing on her own long-term research and extensive work experience, Janice Klein reveals how the power of people (insiders who are able to see problems from outsider's perspective), approach ("pulling change"), and system (support infrastructure) combine to turn new ideas and concepts into institutionalized practices. In particular, certain people inside organizations "outsiders on the inside" are key to driving innovation, adaptation, and real change. Using examples from leading companies in MIT's Leaders for Manufacturing (LFM) and System Design and Management (SDM) Partnership -- such as Boeing, Intel, Motorola, Alcoa, Ford, Kodak, and others -- she shows how employees at all levels can learn how to become "an outsider on the inside," and be in the right place at the right time to discover opportunities to "pull" into their organization. Throughout, we grow to understand the perspectives of numerous "outsiders on the inside," by hearing their voices and observing their actions. The strategy Klein provides is relevant for any company that hopes to build a change capability, rather than attempt only to manage change. Janice Klein is a senior lecturer and researcher at MIT's Sloan School of Management. Author of a textbook, numerous book chapters, and academic journal articles, Klein has also written for Harvard Business Review and Sloan Management Review. A NEW EXECUTION-TYPE RESOURCE: Excellent follow-on for those hungry for examples of how to get things done in organizations. One of the first in the "next generation" of change books. AGAINST THE GRAIN: Provocative viewpoint based on hard solid research, turned into practical advice with well written, attention-grabbing prose. RECOGNIZABLE COMPANIES: Features in depth stories from Boeing, Intel, Hewlett-Packard, Motorola, Alcoa, General Motors, Ford, Chrysler, Polaroid, Kodak, Digital, and NASA, among others.